Manage and record video from up to 50 airCam cameras! The NVR works with UniFi and Airvision cameras but is pre-installed with Airvision video software for quick and easy deployment. The software features an advanced UI and extensive feature set, including custom motion detection zones, event recordings, email alerts, live view monitoring, disk management and analytics. 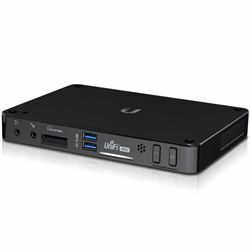 UniFi software must be uploaded to work with the Ubiquity Airvision-C NVR.